by the National Association of State Boating Law Administrators. Ithaca, NY; September 16, 2015. The National Association of State Boating Law Administrators, or NASBLA, recognized New York Sea Grant Extension Recreation Specialist David G. ‘Dave’ White as the Northern States Boating Educator of the Year at its 2015 conference in Wichita, KS, this week. White was recognized for his excellence in boating safety programming by the 20-state Northern Caucus of NASBLA. White is based with New York Sea Grant at SUNY Oswego, Oswego, NY. The New York Sea Grant Great Lakes program also has offices at Cornell Cooperative Extension of Wayne County and SUNY Buffalo. “Dave White has advanced the role of boater safety education in the mission of keeping our waterways safe and creating a safe, enjoyable recreational boating opportunity for everyone,” said Adam Gormely, chairman of the NASBLA Northern Caucus, and a Lieutenant with the Maine Warden Service, Gray, Maine. “Dave White exemplifies the spirit of partnership that benefits all participants, from agencies and academic institutions to citizen groups and private enterprise and most of all the public. His passion, energy and innovation for educating the public about boating safety are unmatched,” said New York Sea Grant Extension Associate Director Katherine Bunting-Howarth, Ithaca, NY. White celebrated his 30th year of public service with New York Sea Grant in 2014. He also serves as Associate Director of the Great Lakes Research Consortium. He is a graduate of SUNY Morrisville, Cornell University, and the SUNY College of Environmental Science and Forestry. 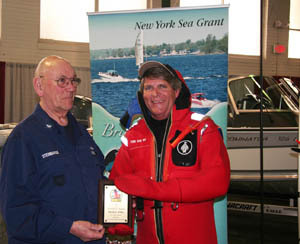 White has been a volunteer boating safety instructor certified in NY since 1985. White has most recently worked with diverse educational and marine industry partners to develop New York maritime history and coastal science technology exhibits for the Great New York State Fair in 2014 and 2015 respectively. White is also a recipient of a BOATUS Foundation Environmental Leadership Commendation and the U.S. Coast Guard Auxiliary Wear It! Award. White conceived, developed and coordinates the award-winning New York Sea Grant Discover Clean and Safe Boating campaign in 2008. As of August 2015, more than half a million boaters and potential boaters have been educated by the campaign that enjoys the support of marine industry partners including the Boating Industries Association of Upstate New York. “Dave has networked with the U.S. Coast Guard Auxiliary and regional Power Squadron personnel and other federal, state, industry and local agencies in publicly-accessible boating education programs, and that translates to saving lives,” says Coast Guard Auxiliary Flotilla 2-2 Commander and Public Affairs Officer Gene Little. The programming developed by White has included boating safety messages customized for a diversity of specific audiences, including anglers, deaf boaters, and NY emergency services personnel responding to cold water rescue calls. In February 2014, Oswego City firefighters who attended the cold water rescue training at the Central NY Boat Show Boat Show credited that training with helping them save a life. 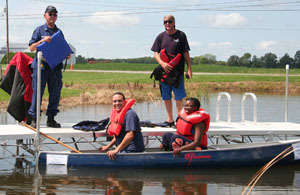 White has partnered with the U.S. Coast Guard Auxiliary, U.S. Power Squadron, and NYS Parks Marine Services Bureau to offer in-water safety demonstrations at events including in a pool at the Central NY Boat Show in February and in the farm pond at Rodman Lott and Son Farms at Empire Farm Days in August. “Dave White takes a come-aboard, all-in approach to educating the public of all ages about boating safety and that is a powerful way to engage people in learning how to protect themselves, their families, and their boating industry customers,” says Central NY Boat Show Manager Andrew Wickham. Since 2011, White has reached more than half a million viewers via Discover Better Boating educational segments on Time Warner Cable News. New York Sea Grant is a cooperative program of Cornell University and the State University of New York is one of 33 university-based programs under the National Sea Grant College Program of the National Oceanic and Atmospheric Administration. Through its statewide network of integrated services, NYSG has been promoting coastal vitality, environmental sustainability, and citizen awareness about the State’s marine and Great Lakes resources since 1971. For updates on New York Sea Grant activities, www.nyseagrant.org has RSS, Facebook, Twitter and YouTube links. 0 Comments to "Sea Grant Specialist Honored as Northern States Boating Educator of the Year"